My name is Hugo and I am a hamster. I live in a 40 x 24 inch home. I also have a brother, McCreamy next to me, who has his own home furnished the very same way as mine. Our wooden home contains three chambers and is also equipped with a bowl made of ceramic, filled with Chinchilla sand. We�re supposed to use this as our toilet, but I prefer to stash my food in there! Besides that, I also dragged my chlorine-free-bleached toilet paper in there, because I love to sleep there! Every other day this is being cleaned � what a service! Talking about cleaning: Good thing, my staff is lazy enough to only clean my apartment irregularly! Since we�re very clean animals, a full clean-up only has to be done in case of illness! They only take the dirty litter away from the top, put some more fresh one back in and mix it with the old litter. 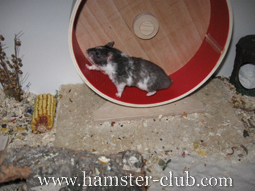 I just love my exercise wheel, which has a diameter of approx. 11 inches and absolutely matches mine. Would it be smaller, I would have to bend my back while running, what would really hurt much when I get older! 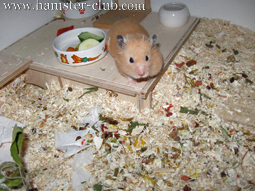 I even know that dwarf hamster need an exercise wheel with a diameter of at least 8 inches! We also have two 11 inch wheels made out of plastics in our outside area. Of course, this is the only thing made of plastic � everything else is made out of wood. Since we don�t want to get hurt nibbling on plastic parts, our wheels are made out of special plastic (made by Transoniq, Wodent Wheel or Rodent Wheel)! They also spoil us with a nice and large bath out of Chinchilla sand. 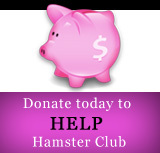 Dwarf hamster do need this to clean their fur, I only dig in it for fun. My toenails get nice and shiny this way! There are also several other possibilities to play hide and seek in my home to be used. Next to a hose of cork there is also a little ceramic house and my staff also created an accommodation made out of toilet paper. I get fed only the most delicious food ordered in the internet, since there�s nothing good to be purchased at the pet shop! 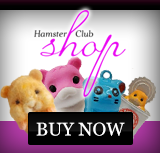 It seems like there definitely are a couple of Internet shops in Germany that are trying hard to produce delicious food without any additives, pellets and extruded products, since these include plenty of stuff that is damaging a hamster�s health! Besides that, we also get fed fresh vegetables like cucumber, zucchini, carrots, peppers as well as daisies and dandelion. This is delicious and we can also hide it easily! As a treat, we get gnawing sticks which don�t contain sugar, honey or molasses. Thus we don�t get fat and our cheeks won�t stick together! We also love sunflower seeds as well as any kind of nuts, which we always get every now and then. They�re supposed to make you fat, too. Our staff also cleans our drinking bottle and the water bowl every day and fills it with fresh water. Yes, we�re really spoiled! Should we get caught at night, we�re being taken to our outside area. Of course not together, since we are loners!! There, we do have our two running wheels, two large homes as well as other possibilities to hide. Also, there are no electrical cables or anything similar, which we�d like to nibble on, but which are also very dangerous! 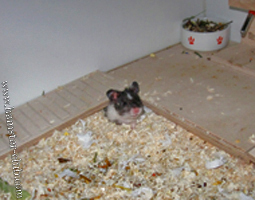 So, I think I told you enough about how to keep a hamster in Germany! I will go back to sleep now and hope that you enjoyed my report! *Photos courtesy of: Rainer H�usler.